Here's an example track chart that I made up tonight for one of the switching areas. I will place these in clear sheet protectors attached to the layout fascia for easy reference by crews. This also allows for easy edits or replacements if things change or if I need to add something else. So operators have access to both sides of the "city" section -- is there access around the complete upper peninsula? Yes, there are aisles on both sides of the peninsula. This limits the total reach to about a foot or so. Looks like a switching paradise! And the one-foot reach is perfect. Once upon a time, I though I could get away with somewhere around 27". Wrong! Now my maximum reach is about half that. Yes, it is quite switching intensive. The premise of this whole thing is the car movements between the SP, UP, NP & SP&S. Everything is in yard limits so I don't have any "mainline" freights as those would be the transfer runs. "Locals" are the switch jobs from Brooklyn (SP) and Albina (UP) Yards and there is the normal yard classification switching at Brooklyn where trains are made up and broken up as they come out of or go to the fiddle yard. One advantage of the 1950's is that car movements and transfers weren't as efficient so that adds up to extra movements (e.g transfers could take a cut of cars to another yard, but had to come back engine only - then the other railroad would do the same). Run-throughs and reciprocal agreements came later in the 60's . 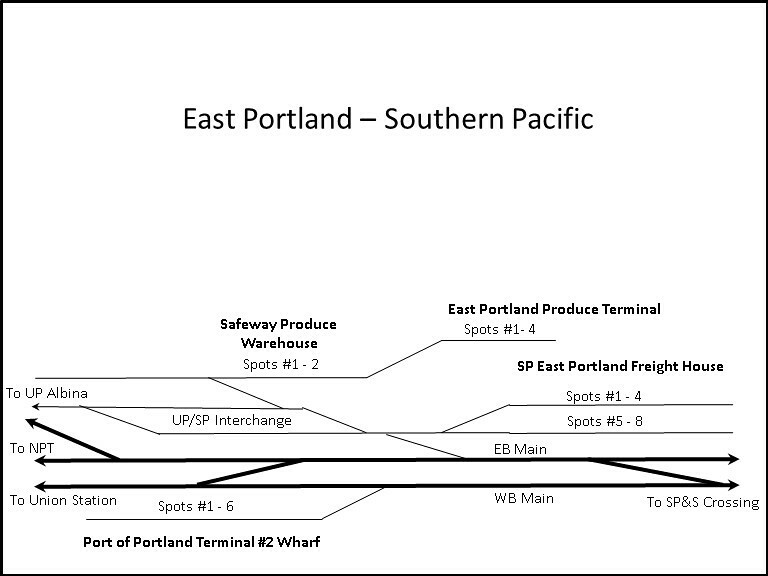 The SP&S was one of the roads (other than GN & NP and later the Milwaukee) that used the Northern Pacific Terminal's yard as a way to interchange between the UP and the SP. The SP&S also used the SP & UP tracks to access its own spur lines in East Portland that went down 3rd Street (in my aisle) and up the south side of Sullivan's Gulch. In fact, the Sears Warehouse spur on the UP's 2nd Street line was actually on the SP&S Sullivan's Gulch line, so I'll be having a SP&S movement out of the NPT yard (SP&S's Hoyt St Yard and engine terminal was just north of Union Station) actually switch this spur. I didn't have room to model the SP&S Sullivan's Gulch line go off layout like the UP line does. In a couple years this line would succumb to the construction of I-80N. The SP&S went down 3rd and swung across the UP and SP to meet the Portland Traction Company's line on Water Street. I did model this crossing as a dummy track from backdrop to aisle. There will be dwarf signals protecting this crossing of the SP here eventually.